Three preseason tilts are now in the books, as the Chicago Blackhawks were victorious last week over the Columbus Blue Jackets, 5-2, and the Detroit Red Wings, 6-1. They dropped their latest contest to the Blue Jackets this past Saturday, 3-2. It’s been fun to watch some stories unfold, but to me, the most intriguing aspect of the preseason so far has been the fight for the remaining roster spots at forward. Who Are the Set Players? It appears the top nine forwards are set, with the exception of Alex DeBrincat. 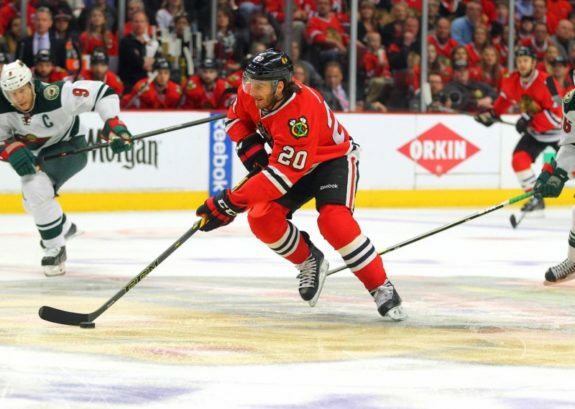 A first line of Brandon Saad, Jonathan Toews, and Richard Panik appears imminent. Patrick Kane is a given on the second line. But will he play with centers Artem Anisimov or Nick Schmaltz? And will his left winger be veteran Patrick Sharp, or the new Wonder Boy, DeBrincat? Ryan Hartman looks to be a lock on the third line, and it appears Tanner Kero will hold down the center position on the fourth line. So, give or take some moving parts on the second and third lines, we’ve established this lineup. DeBrincat has made quite the case for himself to make this team. He played last Thursday and Saturday on the left wing of the second line, alongside Schmaltz and Kane. The three did quite well together, buzzing around the offensive zone and moving the puck with ease to create chances. DeBrincat scored a beauty of a goal Thursday by instinctively stepping up into the play to meet Panik’s pass. But his first few games didn’t come without their mistakes. On Saturday, he tried to force a pass through the middle of the ice that was intercepted and resulted in the first goal for the Blue Jackets. On Sunday at training camp practice, DeBrincat found himself demoted to the third line instead of the second, although this still keeps him among the top nine forwards. If he can continue to look like he belongs offensively, and limit his mistakes, he could find himself in Chicago instead of Rockford to start the season. Who Could Play With Kero? The above lineup has blank spots on both wings of the fourth line. This is the biggest competition to come out of training camp. As long as DeBrincat makes the team, that leaves four more slots available. Two players will take the remaining wing spots, and two players will be backups on the bench. Bouma, Hayden, Hinostroza, Jurco, Kampf, Tootoo and Wingels. Who should play with Kero? Who waits on the bench for their turn? The above tweet neglects to mention Laurent Dauphin. So essentially you have eight candidates for four positions. But things get even more complicated than that. Lance Bouma, Tommy Wingels, Tomas Jurco, and Jordin Tootoo would all have to clear waivers if they were sent down to Rockford. In the interest of not wanting to lose an investment for nothing, the Hawks might be more inclined to keep these players on the roster. It’s only been three games, which is half the sample size provided to make a decision. But I would have to argue none of these four have impressed as much as some of the younger members who are still on the bubble. Who Should Play With Kero? John Hayden played in the first and third preseason games, both against Columbus. In the first game, he contributed three shots on goal and four hits, and spent a good amount of time on both the power play and the penalty kill. Being an asset on the penalty kill is definitely something the Hawks will be looking for from their bottom forwards. In Saturday’s tilt, Hayden was just as impressive, with three shots on goal, five hits, and one takeaway. Heck, he even dropped the gloves. Vinnie Hinostroza only participated in the first preseason game. His speed stood out, and he scored a goal. He spent time on the power play, but only 39 seconds on the penalty kill. It will be interesting to see if he has more of a chance to prove himself in upcoming games. The sad truth is that the Hawks might be looking more for grit than skill for these last positions, in which case Hinostroza doesn’t fit the bill. David Kampf played in the first and second preseason games. In the first, he centered the third line. He was on the ice for 4:54 minutes of short-handed time. He recorded two hits and won 10 of 19 faceoffs (53 percent). 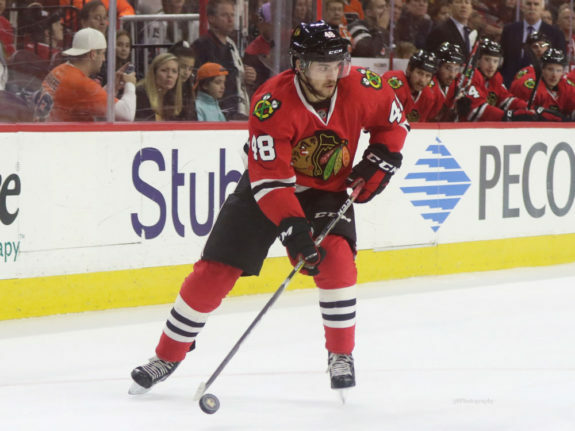 In his second game, Kampf was lucky enough to center the first line, as Toews was out sick. He finished the night a plus-1, played 2:06 minutes on the power play, 1:33 minutes on the penalty kill, had two blocked shots, and went eight out of 15 (53 percent) on the dot. These numbers make me want to see more of him. Laurent Dauphin, like Hinostroza, only played in the first preseason game. He managed a goal, tons of time on both the power play and the penalty kill, three hits, three blocked shots, and one takeaway. Again, it appears that’s deserving of another look. There are many question marks for the Blackhawks as they prepare to embark on their 2017-18 season. A number of roster spots are still up in the air at forward as they hit the midway point of the preseason. Of the players discussed above, I see DeBrincat and Hayden being the most likely youngsters to make the team. Because of their waiver situation, I’m guessing three of the named veterans (Jurco, Bouma, Wingels, and Tootoo) will round out the roster on opening night. It will be interesting to watch the next three exhibition games to see how it all plays out.